My first retirement plan—10 years before I moved to Ecuador—was to spend winters in Arizona and summers living on our 44-foot boat in the Chesapeake Bay. We planned to spend part of the season docked in the small town of Charlestown, Maryland, and the rest of the time cruising up and down the Eastern Shore. The only problem was that that retirement plan required a lot of money, and I would have needed to work many years longer to achieve it. Retiring to Ecuador allowed me to retire prior to the age of 50. But the attraction to boating never waned. And in fact, I still get a fair amount of correspondence inquiring about taking the boating lifestyle abroad. So this week, we’re going to look at three of my favorite places overseas with good marine facilities. 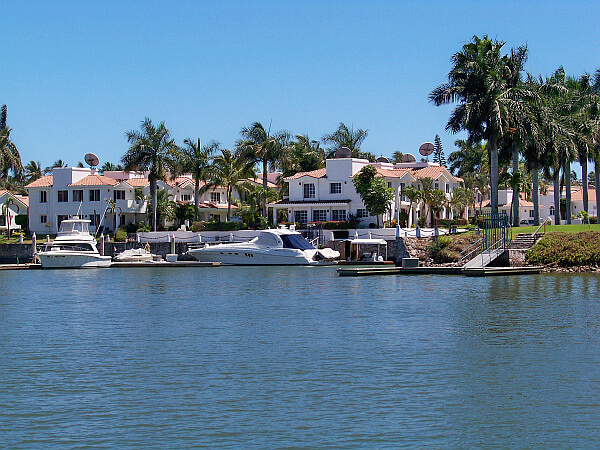 Much more than just a marina, Mazatlán offers an entire Marina District. It includes a large waterway developed by the city, which meanders for over 1.5 miles along the coast between 150 and 1,000 yards inland from the ocean. The full-service marina has 428 slips at this time, and can accommodate boats up to 120 feet in length (37 meters). Aside from the gas dock, amenities include free Wi-Fi, showers and rest rooms, laundry service, a social center, and a supermarket. If you’re cooking on board, you can even get daily fresh fish, shellfish, and vegetable delivery. Along that waterway, various developers have put together some attractive waterfront projects, along with plenty of boat slips to go with them. The largest developments are the El Cid group of projects. They’ve constructed single-family homes, tasteful condos, marina space, and an impressive, 27-hole golf course. I’ve looked at a number of properties here, and I think that the Marina District offers the best waterfront property deals in Mazatlán. They’re not on the ocean, although the waterways do connect to the ocean. And from many of the condos and homes, you can sit on your terrace and look out over the water, watching the boats go by. Why Bring Your Boat To Mazatlán? Mazatlán is a long-time resort city offering a full complement of resort amenities. The city is known for fine dining, miles of beaches, and the world’s longest boardwalk. The famous Golden Zone is adjacent to the Marina District, while the popular, newly-renovated historic center is about 20 minutes farther away. Between the two, you’ll find one of the hemisphere’s longest continuous beaches, bordered by a well-maintained boardwalk, fronted by a few miles of restaurants, cafés, and shops. You can sit on your terrace at this condo, watching the boats passing by, with a boat slip in your front yard. It’s large, at 192 square meters (2,066 square feet), with three bedrooms, three baths, and a terrace facing the Pacific sunset. Taxes were only US$342 for 2016, and the asking price is US$184,900. The unit comes fully furnished, although a boat slip is not included in the price. For a higher level of luxury, I saw another completely-furnished condo for sale on the water, with marble floors, granite counters, three bedrooms, and two baths. The terrace on this one is huge and shady, with lots of room for outdoor living. The asking price is US$235,000. For information on properties here, contact my friend Greg via this page. With a total of 500 slips and moorings, the municipal marina at Punta del Este can accommodate boats up to just over 42 feet in length (13 meters). If you have a longer craft than that, you can moor out in the bay where the cruise ships and larger craft anchor. In addition to its gas dock, the marina offers a restaurant, Wi-Fi, dressing rooms, a weather center, gas station, and supermarket. The yacht club—and its notable restaurant—is located just across the street. Why Bring Your Boat To Punta Del Este? Punta del Este is South America’s number one beach resort, and the marina is one of the best located I’ve found anywhere. From your boat, you can easily walk to a long, calm swimming beach, as well as the best restaurants, cafés, and nightlife that the city has to offer. During my six years as a local full-time resident, I spent many an afternoon and evening in the area’s fine seafood restaurants, as I watched the boats coming and going. Punta del Este’s beautiful beaches, dazzling casinos, world-class restaurants and upscale shops have kept people coming from around the world for almost a century. And perhaps best of all, it’s located in Uruguay, one of Latin America’s First World countries; a country with one of the continent’s highest standards of living, lowest levels of corruption, and best infrastructures. 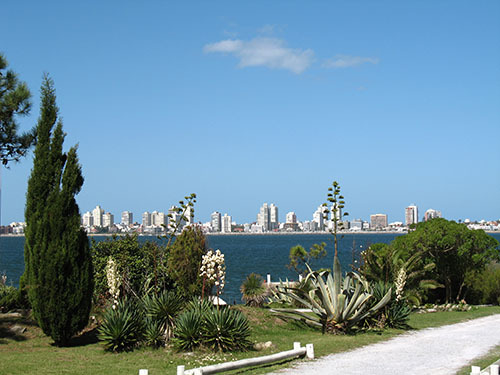 There’s a huge inventory of real estate starting right at the edge of the marina, in Punta del Este’s Peninsula sector. I’ve seen older, modest apartments going for just over US$100,000, and large, luxury apartments going for over US$7 million dollars. And regardless of your price band, you’re in the heart of the area’s best rental market. If you want to be right on the marina—that is, on the boardwalk looking out at the boats—you won’t exactly be in bargain territory. I found a third-floor apartment with two bedrooms, two baths, and a garage space for an asking price of US$400,000. You’ll have an ocean, marina and island views, and be nestled among some of the city’s best restaurants. For a classy apartment that’s not on the water, I found one just a couple of blocks away from the marina, at the lighthouse, on the original old town square. With two bedrooms and two baths, the asking price is US$220,000. A block or two farther away, I found a classic brick building with a one-bedroom, one-bath unit available for an asking price of US$125,000. It’s situated right on the artisan’s square, with a limited water view. For properties in Uruguay, check out their multiple-list site called Buscando Casa. Marina de Lagos claims to be the best marina in the Algarve, and, in fact, they have received four prestigious awards based on the quality of their facilities. The marina is equipped with 462 slips and can accommodate craft up to 98 feet in length (30 meters). In addition to fuel, Marina de Lagos offers Wi-Fi, laundry facilities, showers and rest rooms, as well as professional drivers to shuttle you around. They also host a commercial center, where you’ll find restaurants, shops, and bars. A full supermarket is located about 200 yards north of the marina. Why Bring Your Boat To Lagos? The location of this marina is just perfect for a European home base. The sailing here is claimed to be the best in Europe, so sail-boaters will find the trip worthwhile. Also, the marina is only 200 yards from an amazing sandy beach—over 3 miles long—bordered by calm, clear waters. For the golfer, there are 42 courses on less than 100 miles of this coastline. But best of all, you’ve got Lagos itself… right next to the marina. It’s an ancient city of whitewashed houses, narrow cobblestone streets, quaint cafés and shops. The city is quintessential European history, from its 16th-century city walls—which still encircle the whole of the old town—to its Bandeira Fortress, complete with drawbridge and moat, where Phoenician and Greek merchant ships once sheltered. And with over 320 days of sunshine per year, it’s one of the sunniest spots in Europe. The properties are surprisingly reasonable here, given the history, architecture, and the lifestyle that Lagos offers. In fact, the prices here surprised me. I also found a house, with a great view of the historic center and the marina. It’s in the heart of the historic district, and near the marine facilities. With three bedrooms and three baths, the asking price is 255,000 euros (US$285,600). 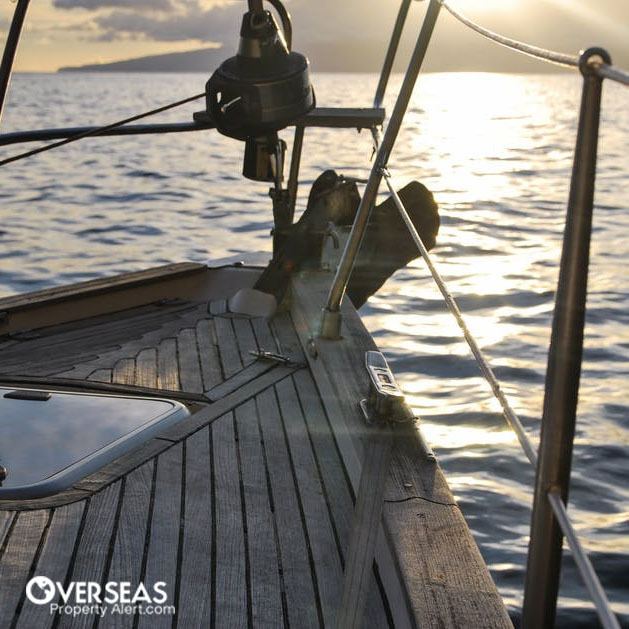 If you’d like boating to be part of your overseas retirement plan, there are some great options out there. It’s another element to consider in an already complex evaluation, but if you like boating, it’s worth the effort. Why would you make friends easily if you’re the only North American around? It really is much easier to make friends with locals if you’re the only foreigner around. Let’s say you live in a Midwestern town of about 100,000 people, and one couple moves in from Argentina. They’re the only Argentines in town, they don’t know anyone, and they’re studying the language, while trying their best to fit in. The natural reaction of Americans in this case would be to try to help them out… try to include them in activities, invite them to events, and basically appreciate them as a cultural addition to the community. Now imagine that five years go by, and you have an expat community of 5,000 Argentines. They stick together, open their own restaurants and shops. They don’t really need to learn the language anymore, as there are enough of them that they can spend all their time in their own circle. So, now, Argentine number 5,001 shows up. To the locals, will he be an appreciated addition to the community or “another Argentine” joining the already-big Argentine expat community? In my experience, it’ll be the former. And it’s the same when North Americans move abroad. I’m a 64 year-old retired federal law enforcement officer, and my dream is to buy a vacation condo or home in Panama or Mexico. My wife is 63 and still working full time at the VA Hospital and plans to work three more years. I would like a place that I could use about two months out of the year, and rent out the rest of the year for income. I’ve looked at beach areas on the Pacific coast in Panama and read your reviews on Puerto Vallarta and Mazatlán in Mexico. I look forward to hearing from you, your reports are very informative and a must-read. This is an interesting question… and I polled our Panama staff to get the best input. In Panama, take a look at the areas around Coronado, Chame, and Gorgona… these markets are the best performers for beach properties in Panama. Collectively, we usually refer to these as the “Panama City Beaches,” due to their proximity to Panama City and the airport. This area started with Coronado, and the entire area is still sometimes (erroneously) labeled as Coronado. But as you’ll see when you visit, there’s a lot more going on there than just Coronado. The most populous area is between Chame and Rio Hato… you’ll find a lot of rental action there. I recently learned of a good property tour in that area that has received very positive feedback. I haven’t gone, but I’ve met the operators and they know their stuff. You can learn more here. And if you get in touch, ask them about the Royal Palm project… if inventory remains, the rental projections on that one were pretty good. In Mexico, I think you could get a good-performing rental in either Puerto Vallarta or Mazatlán, but to get good year-round performance, you’ll need to be choosy with your sector within those markets. 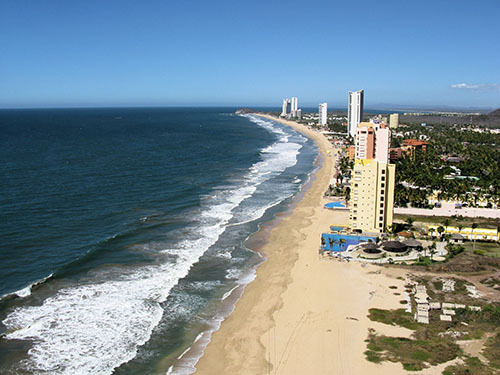 Mazatlán (for example) has a strong rental market in the off-season (the summer), but not in all areas. Now we are rethinking the “driving” piece of this trip, and think hooking up with a car service to get around the country might make sense. Any input would be great. Also, is there a simple way to meet expats to talk to about retiring there? We are new to all of this, and would really like some help. I’ve driven Nicaragua from top to bottom, and have never had a problem… and even if I were pulled over, the freedom one has while driving on your own is worth it (to me). It actually depends on the scope of your exploration. If you’ll be focused on Granada, renting a car will be more of a burden than it’s worth, as the city is so walkable. For checking out Granada, I’d get a shuttle from the airport (about 40 minutes or so) and then walk around town. If you’re going farther afield, you can use a local taxi or car service, rather than rent a car. If you’re going to explore the rest of the country, I’d go with the rental car when you leave Granada. For meeting expats, you’ll have no trouble in Granada. Many of the nicer hotels and restaurants are expat-owned, and can provide a gateway to the expat community.